Always cool, old stuff rolling through. Sears Silvertone 1483 from I believe 1966. It is a 23W bass amp and the two channels are identical. This one does 17W with the original tubes which are RCAs labeled “Silvertone” so not too bad. I think this one had been sitting for a while. V1 was totally crackley but there weren’t any cracked solder connections like I expected (it was pretty bad), the tube socket was just all old and crusty and corroded. Worked nice after a good cleaning of the pots and jacks and tube sockets. Kinda noisey with the old caps and possibly also because of the carbon comp 100K plate resistors in the preamp but it will stay that way and stay original because it works pretty good. 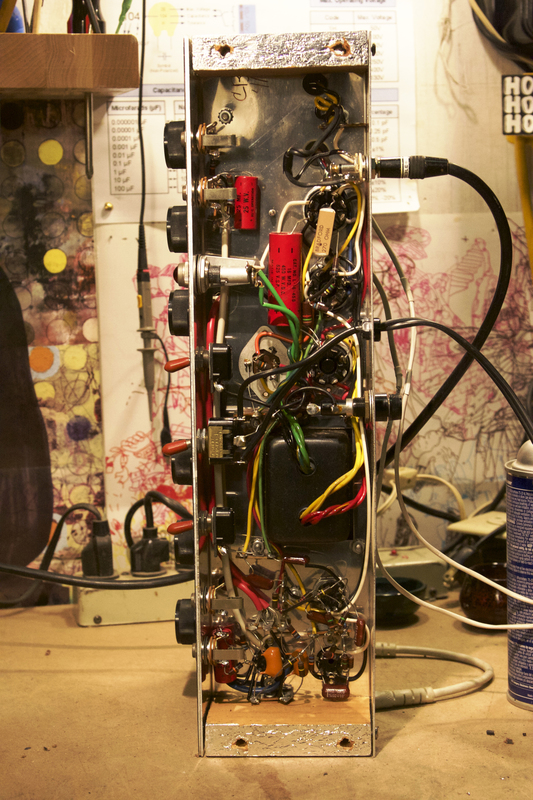 Check out the wiring/routing of the preamp towards the bottom of the chassis — a big tangle of resistors and caps flying everywhere, looks awesome. 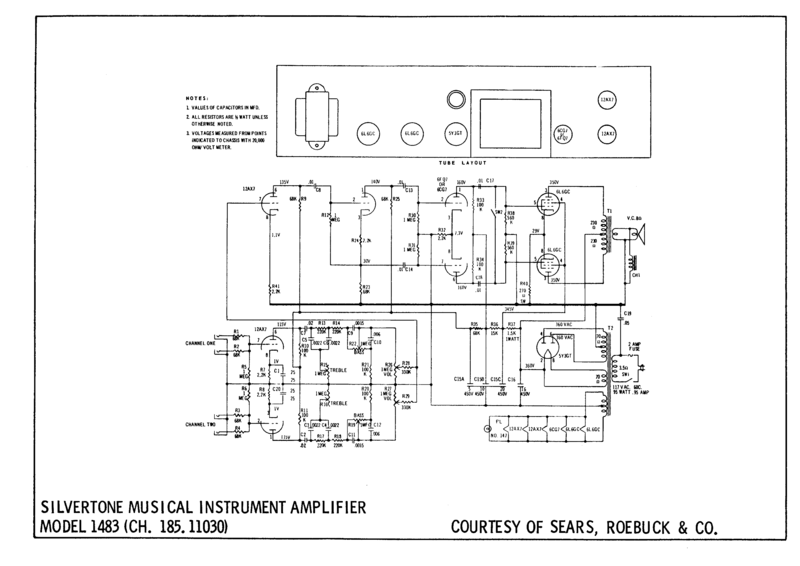 Silvertone 1483 schematic. Look how it lists the resistance of the transformer windings. 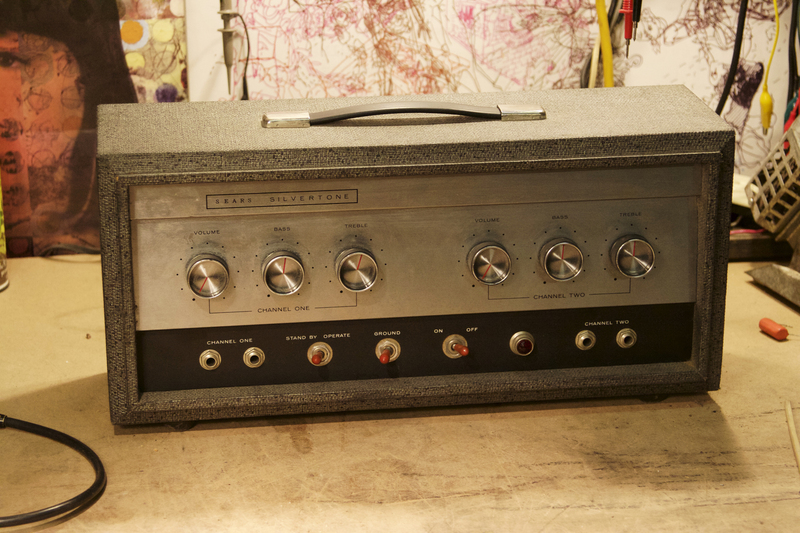 I would give this amp an A+ at being cheap, simple and good.